The Future Collective keep bringing us great music. 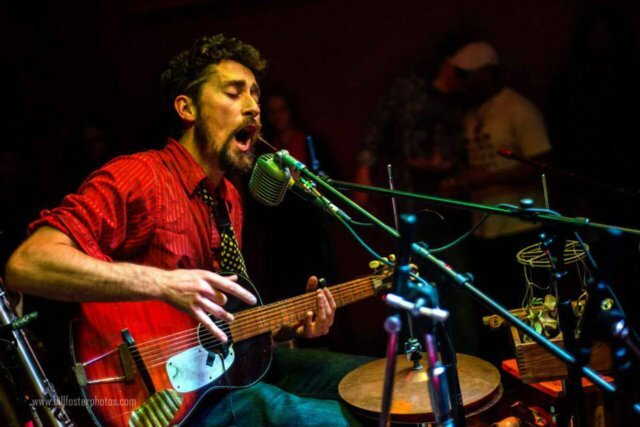 Their latest show featured The Suitcase Junket, a one-man band led by Matt Lorenz, a Vermonter now living in Amherst who’s already getting airplay on The River. In addition to having an amazing voice and top notch songs, in a quirky folk vein, he also knows how to put on a show. Tuning his hugely beat-up dumpster guitar became part of the act, and everyone enjoyed meeting the band (“this box of assorted metalware is the high hat…”). What intrigued me even more than his making random junk sound musical was his ability to do the equivalent of Tuvan throat singing which added an exotic touch. He has a new record, his third, entitled Make Time, which has been getting good reviews. Speaking of exotic, the headliners Bella’s Bartok were another Amherst band (formerly of Northampton) who do a lively melange of Russian Kletzmer political dance music that you will not hear the likes of anywhere else. They grew on me, and by the end, I was ready to join them in a Cossack dance (if that’s appropriate). The lead singer sported a curly mustache and touque to match, giving their performance a theatrical air. He was ably abetted by the singer/guitarist/clarinetist who seemed to be channeling both Chico Marx and Isadora Duncan at the same time. Although their music doesn’t fall into any current genres of dance music that I know of, it is highly danceable and with seven members (including two horn players!) they’re not lacking in firepower. Check out The Bagend March on their new ep on Bandcamp. Wooly Mar, AKA Maria Pugnetti, seemed ill at ease but she charmed us all with her beautiful tone poems and groovy beats. Her stuff is so unique, she really ought to record some of it for posterity. But to Ms. Mar, it all seems to be a work in progress, “experimental” as it were, and maybe not ready in her eyes. But it sure sounds ready to me, and I hope she puts out something before she moves on to a new style altogether, as I suspect she has a tendency to do. In all, it was another satisfying evening of music, with bands that worked well together in every way. Your next opportunity to hear music at the Future is April 3.